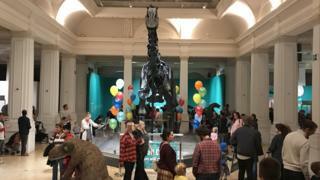 Crowds of people have enjoyed the final day of Dippy the dinosaur's time in Birmingham. Over 250,000 people have visited the exhibition at Birmingham Museum and Art Gallery, making it the museum's most successful temporary exhibition. 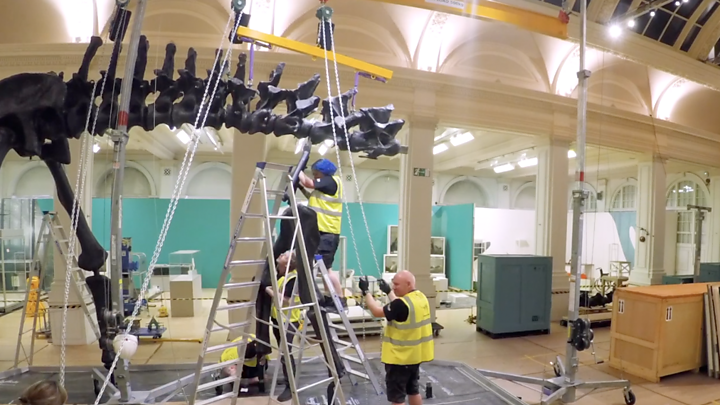 The replica diplodocus skeleton used to stand in the entrance hall to London's Natural History Museum but has been in Birmingham since the end of May. The replica is 70ft (21m) long and has 292 bones. The museum's manager Gurminder Kenth said the whole city had "embraced" the exhibition, which closed on Sunday at 17:00 BST. "It's been really positive, he's [Dippy] a national treasure and the reviews have been great. "Dinosaurs continue to captivate people of all ages, and in an ever-increasingly technological world, this exhibition has shown how nature can continue to engage and fascinate us all." Dippy's tour around the UK continues, with its next home being Ulster Museum in Belfast. Its three-year tour aims to introduce 1.5 million people to the exhibit.